When my son Dan’s obsessive-compulsive disorder was at its worst, he would spend hours at a time doing nothing (except obsessing and ritualizing of course), even though he so wanted to successfully complete his freshman year of college. It was frustrating and heartbreaking for me to watch. Why couldn’t he just do his work? Procrastination in those with OCD is not unusual, and my guess is there are many reasons why this is true. For Dan at this time, OCD was definitely calling the shots, telling him when and where he could or could not do his schoolwork. Also he is a perfectionist, which is a common trait for those with OCD. But he was dealing with unhealthy perfectionism characterized by fear, doubt, and control. It’s not hard to see how this could lead to procrastination. Mistakes were not an option, and the only way to not make mistakes is to just put off doing the task, or worse, not attempt it at all. Avoidance can be seen as a compulsion in OCD. Someone with OCD might avoid a potentially triggering situation, or at the very least, procrastinate as long as possible until the inevitable must be faced. Perhaps another reason for procrastination is that many people with OCD have a propensity toward indecision. It is so important to make the right decision that it’s just easier to procrastinate, or even not make any decision at all, which of course brings us back to avoidance. So how can those with obsessive-compulsive disorder stop procrastinating? Obviously, getting the right treatment for OCD should help immensely, and is the most important step you can take. Another strategy involves using a timer to inform you it’s time to make a decision or start a task. Or if you are facing a particularly daunting undertaking, you can use a timer and tell yourself you only have to work for ten minutes to start, and then take it from there. You might find that once you’ve started, the task at hand is not nearly as difficult or frightening as you had anticipated. Scheduling a specific date and/or time on the calendar can also be helpful for those who procrastinate. And how about making a list, perhaps even including exactly when something should be done? Many of us love the feeling of crossing things off our lists. All of these suggestions help take the thinking, or ruminating, out of the equation, as timing has been predetermined. 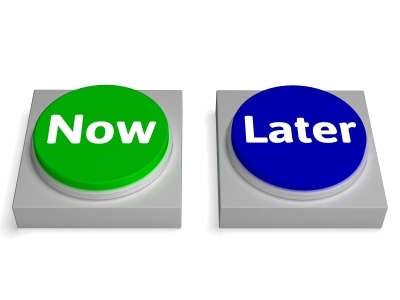 Procrastination wastes precious time that should be spent living the lives we want for ourselves. Of course we all procrastinate now and then, but if it is affecting your life significantly, I hope you’ll get help. We all deserve to be able to live full lives – now, not later.